As a designer and avid guitarist, Dave McAuld wanted to play music as he travelled the world. The idea took root more than 20 years ago, but it was only when mobile technology became more mainstream that Fusion became a viable concept. Using SOLIDWORKS, Dave created Fusion Guitars, the world’s most advanced electric guitars. With an integrated amp, speakers, battery and iPhone dock, the Fusion is redefining what an electric guitar is, and what it can do. “My life has been about music and my quest to create the ultimate electric guitar. We designed the Fusion Guitar to be the 21st century guitarists’ gateway to enjoyable musical expression anywhere and anytime. Combining the Fusion with iOS guitar apps unleashes amazing possibilities for learning, creating, performing, and sharing music,” said Dave McAuld, Founder of Fusion Guitars. A key feature of any guitar is its shape. The Fusion is no different. The surfacing features in SOLIDWORKS were the most important features for this project – helping to design the elegant organic shape needed to integrate seamlessly with the linear neck and strings of the guitar. Plus, being able to design the instrument to scale and building a parametric model was critical for minimizing design iterations. The first step in the design process was to create the Fusion Guitar body. This involved creating a 2D sketch of the concept followed by building a full-scale version of the guitar body with blue foam sculpting. Once the model was close to an optimal design, it was then 3D scanned to produce a scan mesh graphic surface. This graphic surface was then imported into SOLIDWORKS and used as reference geometry for the surface body. 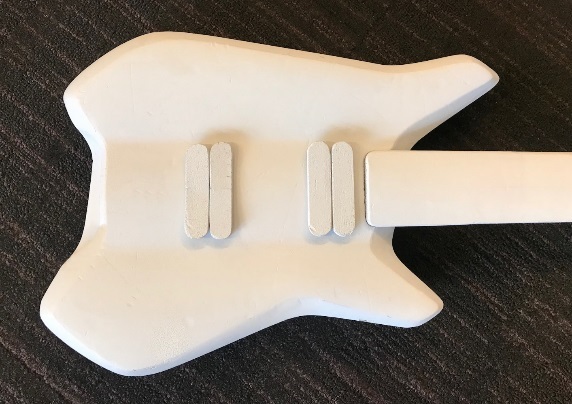 Within the SOLIDWORKS application, Dave was able to create a full body design, working through multiple variations of how the various parts of the guitar fit together – from the neck to the strings and even the smartphone device dock. SOLIDWORKS was a critical solution in providing a one-stop shop for surfacing, detailing, FEA, manufacturing documentation and even renderings for presentations. In August 2017, Fusion Guitar was launched through a successful crowdfunding campaign on Indiegogo. More than 1,000 instruments were pre-sold. The revolutionary all-in-one electric guitar, is essentially a new product category, as the built-in iPhone dock allows for the use of applications that can make the guitar emulate any guitar effect. Fusion Guitar has also been awarded Best Design Award, Consumer Electronics, Australia’s oldest and most prestigious design awards program, promoting excellence in design and innovation. For more information on the Fusion Guitar’s features and its integration with iPhone as well as the apps you can use to create music watch this video by Dave McAuld. This video review of Guitar World Tech Editor Paul Riario will take you through all the different features of the Fusion Guitar. Want to learn more about how you can design smarter products faster? Click the banner below to learn how multiple disciplines and industries can accelerate product development by using a simplified collaborative solution like SOLIDWORKS Electrical.